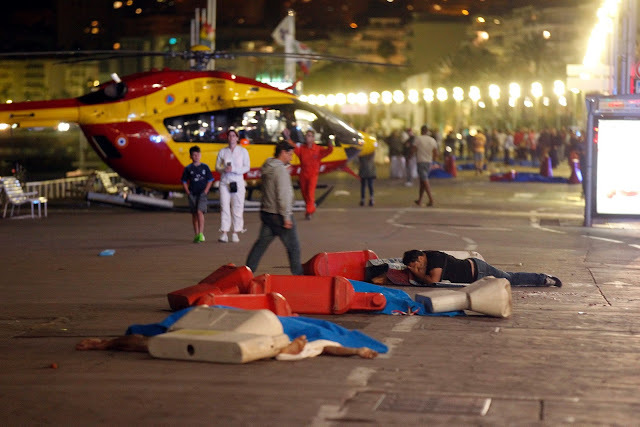 Witnesses have described seeing "bodies flying like bowling pins" when a truck packed with weapons ploughed into a crowd during Bastille Day celebrations in the French city of Nice. At least 80 people have been killed according to the French Interior Minister Bernard Cazeneuve. Many of the 84 are children. At least 18 are in a critical condition. The death toll has been climbing since the attack began about 7.00am AEST. A spokesman for France's Interior Ministry said "it's going to be a very high toll". The driver is among the dead. The incident interrupted a fireworks display for the national celebration when the huge truck rammed into the crowd celebrating on the French Riviera. Mown down bodies remain strewn on the streets and the scene has been described as "apocalyptic" and "carnage on the road". Christian Estrosi, president of the region, says the truck in that caused carnage in the southern city was loaded with grenades, guns and larger weapons. Witnesses have described "running over bodies". A French journalist at the scene said: "I saw bodies flying like bowling pins along its route. Heard noises, cries that I will never forget." A man who witnessed the attack told CNN he saw the driver accelerate and aim for people as the vehicle slammed the crowd. The truck continued about two kilometres through the city's busy main drag mowing down people in its path. The driver then emerged from the truck and opened fire on the crowd, another eyewitness said. French media is now reporting the gunman got back in the driver's seat and travelled to another populated area before starting to shoot again. Police opened fire on the truck which crushed revellers and sent people running for their lives. The truck's driver was shot dead. French President Francois Hollande said the attack was clearly a "terrorist" act. Unconfirmed reports are circulating suggesting terror outfit Islamic State has claimed responsibility for the attack. The driver was a 31-year-old man of Tunisian origin and a resident of Nice. Details of his identity were obtained from papers found in the shot up truck following the attack. The truck driver was said to have shouted "allahu Akbar" (God the great) before being shot dead by police, local newspaper Nice-Martin reported. French newspapers have previewed their front pages following the overnight attack. Words like "carnage" and "horror" will dominate newsstands, accompanied by grim pictures of the shot up attack truck and lifeless bodies on the city's streets covered by sheets.